With the evidence coming in from one study after another, scientists are now more certain than ever that oil and gas drilling is causing hundreds upon hundreds of earthquakes across the U.S. So far, the quakes have been mostly small and have done little damage beyond cracking plaster, toppling bricks and rattling nerves. But scientists warn that the shaking can dramatically increase the chances of bigger, more dangerous quakes. Up to now, the oil and gas industry has generally argued that any such link requires further study. But the rapidly mounting evidence could bring heavier regulation down on drillers and make it more difficult for them to get projects approved. The potential for man-made quakes "is an important and legitimate concern that must be taken very seriously by regulators and industry," said Jason Bordoff, founding director of the Center on Global Energy Policy at Columbia University. He said companies and states can reduce the risk by taking such steps as monitoring operations more closely, imposing tighter standards and recycling wastewater from drilling instead of injecting it underground. A series of government and academic studies over the past few years—including at least two reports released this week alone—has added to the body of evidence implicating the U.S. drilling boom that has created a bounty of jobs and tax revenue over the past decade or so. On Thursday, the U.S. Geological Survey released the first comprehensive maps pinpointing more than a dozen areas in the central and eastern U.S. that have been jolted by quakes that the researchers said were triggered by drilling. The report said man-made quakes tied to industry operations have been on the rise. Scientists have mainly attributed the spike to the injection of wastewater deep underground, a practice they say can activate dormant faults. Only a few cases of shaking have been blamed on fracking, in which large volumes of water, sand and chemicals are pumped into rock formations to crack them open and free oil or gas. "The picture is very clear" that wastewater injection can cause faults to move, said USGS geophysicist William Ellsworth. Until recently, Oklahoma—one of the biggest energy-producing states—had been cautious about linking the spate of quakes to drilling. But the Oklahoma Geological Survey acknowledged earlier this week that it is "very likely" that recent seismic activity was caused by the injection of wastewater into oil and gas wells. 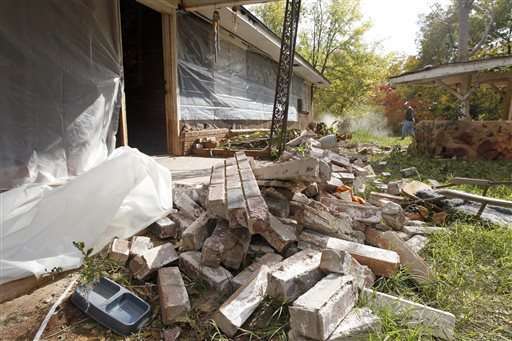 Angela Spotts, who lives outside Stillwater, Oklahoma, in an area with a number of wastewater disposal wells, said the shaking has damaged her brick home. She pointed to the cracked interior and exterior walls, and windows and kitchen cabinets that are separating from the structure. "There's been no doubt in my mind what's causing them," Spotts said. "Sadly, it's really taken a long time for people to come around. Our lives are being placed at risk. Our homes are being broken." Yet another study, this one published Tuesday in the journal Nature Communications, connected a swarm of small quakes west of Fort Worth, Texas, to nearby natural gas wells and wastewater disposal. The American Petroleum Institute said the industry is working with scientists and regulators "to better understand the issue and work toward collaborative solutions." The Environmental Protection Agency said there no plans for new regulations as a result of the USGS study. "We knew there would be challenges there, but they can be overcome," EPA Administrator Gina McCarthy said Thursday at an energy conference in Houston. For decades, earthquakes were an afterthought in the central and eastern U.S., which worried more about tornadoes, floods and hurricanes. Since 2009, quakes have sharply increased, and in some surprising places. 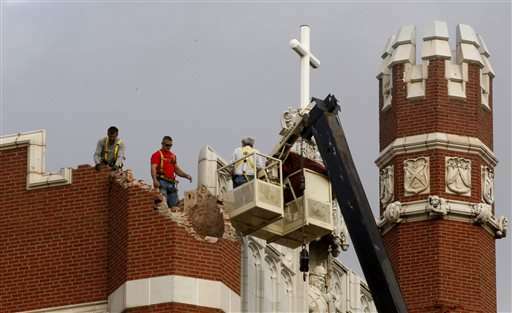 The ground has been trembling in regions that were once seismically stable, including parts of Alabama, Arkansas, Colorado, Kansas, New Mexico, Ohio, Oklahoma and Texas. The largest jolt linked to wastewater injection—a magnitude-5.6 that hit Prague, Oklahoma, in 2011—damaged 200 buildings and shook a college football stadium. 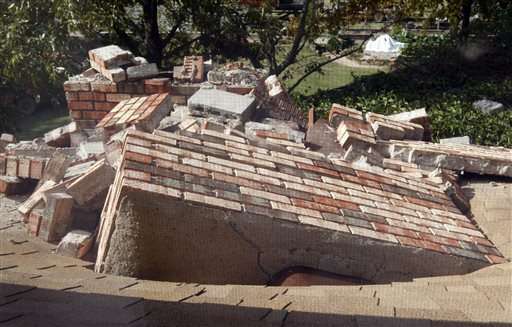 The uptick in Oklahoma quakes has prompted state regulators to require a seismic review of all proposed disposal wells. The Oklahoma Corporation Commission, which regulates the oil and gas industry, has ordered dozens of disposal wells to stop operating or change the way they are run because of concerns they might be triggering earthquakes, said spokesman Matt Skinner. "There are far more steps that will be taken," Skinner said. Last year, regulators in Colorado ordered an operator to temporarily stop injecting wastewater after the job was believed to be linked to several small quakes.